Today is a great day. My new dual 3 GHz Quad Core Xeon Mac Pro with 4GB (soon to be 12GB) of RAM and NVidia 8800GT graphics card arrived! Having never before documented a new computer purchase, I figured "what better way to spend the almost three hours of Adobe CS3 installation than to shoot and post some un-boxing pr0n?" 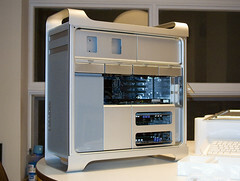 Tags: "Mac Pro", "unbox pr0n"